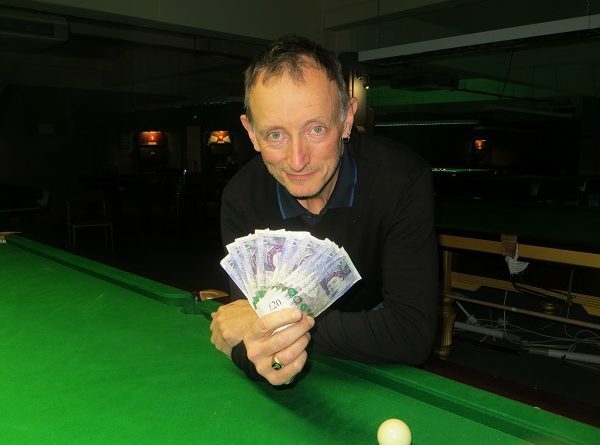 COLIN Norton admitted he was overwhelmed after winning a high-quality amateur snooker tournament in London. The Portsmouth league legend has endured a ten-year battle with a condition, sometimes referred to as cueitis, which makes it hard to pull his cue back. But now he has earned a place in the Cuestars Championship Tour record books. Clutching £200 prize money after beating Nick Jennings 2-0 in the final of the sixth leg at Frames Sports Bar, Coulsdon, Norton opened his heart. “This means as much to me as anything I’ve ever won,” he said. Cuestars officials confirmed that the 52-year-old from Gosport is the oldest winner of a Championship Tour event. It was certainly not a crash, bang, wallop final. Not exactly old-school, either, but thoughtful. Norton, who was making his debut in the competition, took the opening frame on the pink. And he set up a remarkable victory in the next with a 58 break, his highest of the day. His 27-year-old opponent from Otterbourne, who was also runner-up in the previous leg in Fareham, pocketed £100. Norton has been suffering with cueitis since the Championship Tour was launched in 2009. He said: “A few times I’ve taken six or eight months off snooker just to then come back and think that’s it, cured. But no, it soon creeps back. “So I never thought I’d win anything again. Under-playing the fact that he compiled a 58 on a tight professional standard Star table, Norton insisted: “My safety game got me through. Explaining why he entered the event, he said: “I missed playing in that sort of environment. The 35-strong field for the event, which was sponsored by Frames Sports Bar and Mr Gold, returned 28 breaks of 50 or more. Rankings leader Mark Lloyd recorded the highest of 84 in his 2-1 quarter-final defeat by Norton. Lloyd (Gosport) extended his advantage over Aldershot hotshot Ryan Mears to ten points after beating his title-rival 2-0 in the last-16. Pascal Richard (Gosport) is 12 points further back in third place. Elliott Weston (Portsmouth) reached the last-eight for the first time. Ahmed made his first semi-final appearance for more than two years. And Martin Wallace (Wokingham) produced a shock 2-0 victory over Mears in his first group match – but it was the only frames he won all day. The Crucible Sports & Social Club, Newbury, hosts the seventh leg of eight on Sunday, March 3. Visit www.framessportsbar.co.uk for more information about Frames Sports Bar. Contact Mr Gold via [email protected] or ring 07930 355677. Adam Nash: 72, 69, 61. GROUP A: 1st, Mark Lloyd (Stoke SC, Gosport); 2nd, Mickey Joyce (Academy, Basingstoke); 3rd, Ryan Hughes (Chandlers Ford SC); 4th, Jack Mullen (Frames, Coulsdon). GROUP B: 1st, Jack Smithers (Frames, Coulsdon); 2nd, Ryan Mears (Sovereign, Farnborough); 3rd, James Height (Break N Dish, Street); 4th, Martin Wallace (Crucible, Newbury). GROUP C: 1st, Matt Ford (Sunninghill Comrades Club); 2nd, Ronnie Blake (Frames, Coulsdon); 3rd, Pascal Richard (Mayfair, Gosport); 4th, Craig Marsh (Crucible, Newbury). GROUP D: 1st, Labeeb Ahmed (Frames, Coulsdon); 2nd, Oliver Sykes (Chandlers Ford SC); 3rd, Christian Chislett (Churchills, Eastleigh); 4th, Henry Eastwood (Frames, Coulsdon). GROUP E: 1st, Paul Bunyard (Sunninghill Comrades Club); 2nd, James Cullen (Woking SC); 3rd, Jamie Wilson (Waterlooville Sports Bar); 4th, Andrew Darken (Chertsey SSRN Club). GROUP F: 1st, Nick Jennings (Churchills, Eastleigh); 2nd, Adam Nash (Churchills, Eastleigh); 3rd, Steven Hughes (Chandlers Ford SC); 4th, George Heatley (Woking SC); 5th, Dan Sykes (Chandlers Ford SC). GROUP G: 1st, Ian Rose (Sunninghill Comrades Club); 2nd, Colin Norton (Waterlooville Sports Bar); 3rd, Ross Barker (Abingdon Cons); 4th, Ronnie Sullivan (Frames, Coulsdon); 5th, Wasim Khan (Liberal Club, High Wycombe). GROUP H: 1st, Connor Benzey (Chandlers Ford SC); 2nd, Elliott Weston (Top Spot, Havant); 3rd, James Budd (Stoke SC, Gosport); 4th, Arron Smith (Selsey RBL); 5th, Henry Smith. LAST-16 (10 points): Lloyd 2-0 Mears, Norton 2-0 Benzey, Bunyard 2-1 Nash, Ahmed 2-1 Blake, Ford 2-0 O Sykes, Jennings 2-0 Cullen, Weston 2-1 Rose, Smithers 2-0 Joyce. QUARTER-FINALS (12 points): Norton 2-1 Lloyd, Ahmed 2-1 Bunyard, Jennings 2-0 Ford, Smithers 2-1 Weston. SEMI-FINALS (£25, 15 points): Norton 2-0 Ahmed. Jennings 2-0 Smithers. FINAL (£200/£100, 25/18 points): Norton 2-0 Jennings.